Since the early days of photographic and cinematic history, the camera design has undergone many changes and upgrades. Some of those changes were made when people were still experimenting with the technology and some of the changes were made out of necessity, for a certain, specialized, usage of the “shooting” device. There are many metaphors that connect guns and cameras together, in fact, the term “shot” derives from the early days of film production when cameras were hand-cranked and operated similarly to the hand-cranked machine guns of the time. That is, a cameraman would “shoot” film the way someone would “shoot” bullets from a machine gun. The following vintage recording gadgets are taking the phrase ‘”point and shoot” quite literally. The gun-like camera examples shown here are either experimental, sniper-styled paparazzi “weapons”, or made to look like an actual firearm out of purely esthetic reasons. 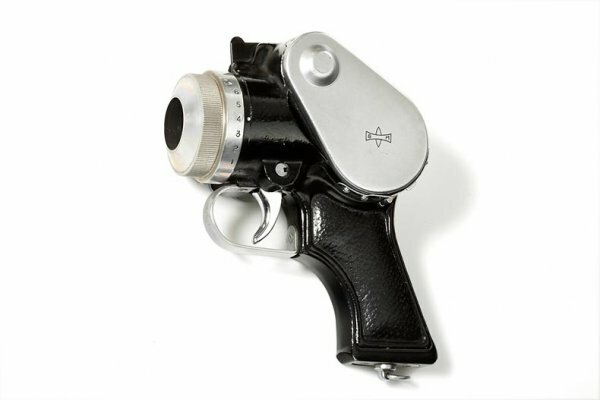 Most of the serious research on pistol-shaped cameras started in Japan in the late 1940s, certainly instigated by the police forces. The intended use was to catch photographic evidence of criminal behavior in the act. The first such cameras were the Gemmy and the Seiki 16 pistol camera, both made around 1950 and the Doryu 1, completed in 1952. The demand for easily operated cameras for police forces in Japan was made more pressing after the “bloody May Day incident”. A clash between Tokyo protesters and policemen happened on May Day 1952, where two people were killed and more than 740 were injured. It is said that various policemen were injured while taking photographs of the protesters: with their eye on the viewfinder they could not see their opponents. As a result, the Japanese police wanted a camera which would be easy to aim without raising it to the eye, and a pistol-shaped camera was considered ideal because the policemen are supposedly good at gun handling. As of April 20, 1954, the Osaka police headquarters had received thirty units for experimenting. During the trials, some concern was raised that the object would be confused with a true pistol, frightening the subjects with unpredictable results, and causing stone throwers to target the photographers. The Doryu 1 or Doryu 1-9.5 is a pistol-shaped camera taking 9.5mm film, completed in 1952 by the Doryu company at prototype level only. The Doryu cameras were developed for police and surveillance tasks, mainly to catch photographic evidence of criminal behavior in the act. The first camera was developed from 1949, with some degree of official support, and was completed in 1952 as the Doryu 1 or 1-9.5, taking 9.5mm film. It never went into production because of durability problems: the bakelite joints tended to come loose with heat, and shock-resistance was insufficient for the intended use. The low availability of 9.5mm film stock in Japan was another drawback. 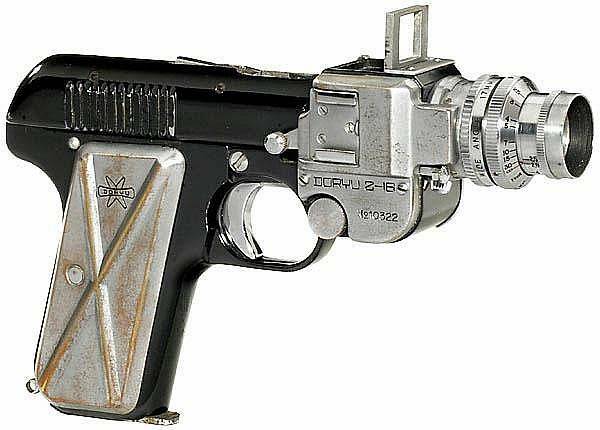 The Doryu 2-16 is a pistol-shaped camera taking 16mm film, made from 1954 to 1956 by the Doryu company. Like its predecessor (The Doryu 1), it was also made for police and surveillance tasks. The device is shaped like an automatic pistol, with a handgrip and a trigger. The total weight is 582g, with 282g for the camera part alone, and 300g for the rear part with the flash system (including five magnesium cartridges). It is ideally distributed around the trigger, giving good hand-held stability with focal lengths lower than 30mm. Étienne-Jules Marey’s chronophotographic gun was made in 1882, this instrument was capable of taking 12 consecutive frames a second, with all the frames recorded in the same picture. Using these pictures he studied horses, birds, dogs, sheep, donkeys, elephants, fish, microscopic creatures, mollusks, insects, reptiles, etc. Some call it Marey’s “animated zoo”. Marey also conducted the famous study about cats always landing on their feet. He conducted very similar studies with a chicken and a dog and found that they could do almost the same. Marey also studied human locomotion. He published another book Le Mouvement in 1894. Marey also made movies. They were at a high speed (60 images per second) and of excellent image quality. His research on how to capture and display moving images helped the emerging field of cinematography. Marey, the inventor of this interesting contraption, eventually got the nickname “Fool of Posillipo”. People constantly saw him wandering around the countryside, aiming at birds but never firing a single shot at them. This rifle-camera was invented by Mr. BW Kilburn of Littleton New Hampture in order to simplify the taking of 4×5 pictures among the White Mountains where in many spots it is extremely difficult to erect a tripod. He wanted to be able to get rid of the tripod. It was hard for him to place it so that the camera will be in the proper plane, and keep both tripod and the camera from being overturned. The Kilburn Gun Camera was manufactured by Scovill Mfg. Co. from approximately 1882 to 1886. A very neat looking camera design. 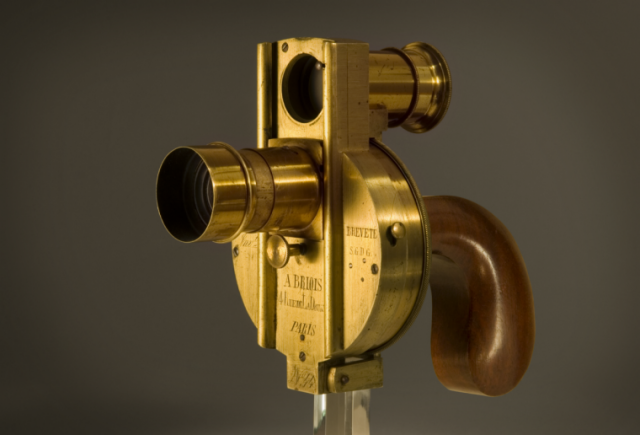 This gun-camera is designed by Mr. Thompson and manufactured by A. Briois in France, 1862. Briois was a French camera maker based in Paris. Mr. Thompson was an Englishman. Not much is known about his life, but apparently he took inspiration for his camera from a certain famous gun. 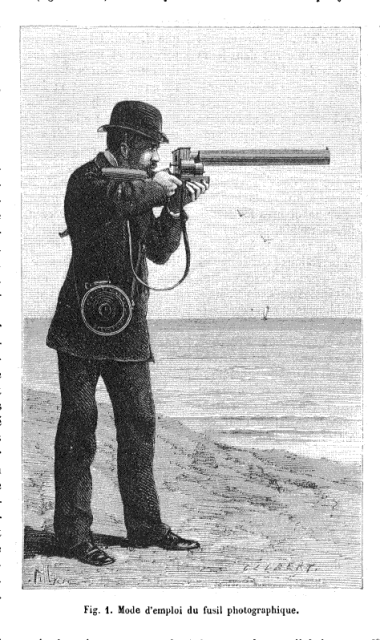 The camera “Revolver Photographique”, or “Thompson’s revolver camera”, was resembling more of a Colt than of a camera. Instead of bullets, the cylinder was loaded with four wet glass plates. 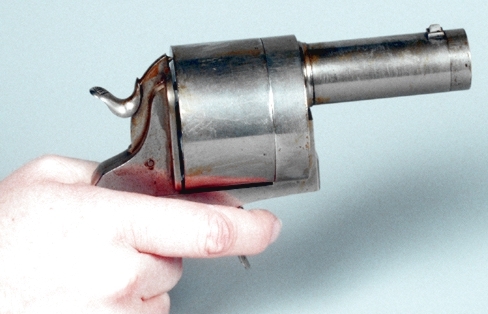 The Photo-Revolver de Poche was invented byThéophile-Ernest Enjalbert in Montpellier, France and constructed from 1882-1892. The camera was obviously designed to look and operate like a handgun. Instead of real bullets, the gun cylinder held ten 16 x 16mm dry plates. The image was taken just as if you were shooting a pistol, aim via the aiming sight located on the top of the barrel and pull the trigger which instantaneously exposed the plate. Pulling the trigger back allowed the cylinder to be rotated for the next shot.